In addition to 2nd Call for Proposals information sessions, held in Subotica, Sremska Mitrovica, Našice and Ilok, Managing Authority and Joint Secretariat featured a thematic workshop intended for potential applicants whose projects will aim to promote the use of sustainable energy and energy efficiency. 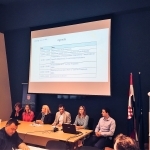 The workshop was held on 8 May, in the premises of Ministry for Regional Development and EU Funds in Zagreb. The intention was to emphasize specific challenges related to Priority Axis 2, especially Specific Objective 2.2. and to provide potential applicants networking opportunity in order to find partners and prepare project applications within 2nd Call for Proposals. The workshop highlighted challenges in improving energy efficiency throughout the Programme area and encouraged the participation of attendees in active discussion. There were 47 participants that attended the workshop. 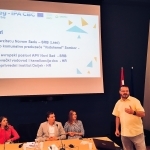 A presentation covering first-hand experiences on implementing projects within relevant Specific objective was delivered by prof. Filip Kulić, from the Faculty of Technical Sciences in Novi Sad. 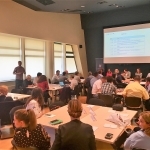 Prof. Kulić offered an insight into main challenges of XDEGREE project implementation, a project contracted within the 1st Call for Proposals that aims to promote and improve the use of various forms of renewable energy sources in the cross-border area. Any additional issues regarding 2 Call for proposals in relation to energy efficiency can be directed to js@interreg-croatia-serbia2014-2020.eu.